The daily life of the ordinary ancient Egyptian is rarely glimpsed in ancient sources, but the large number of private letters and other administrative documents dating to the Graeco- Roman Period allows us to reconstruct the family life of the ‘common’ people who formed the vast majority of the population of Egypt at this time. 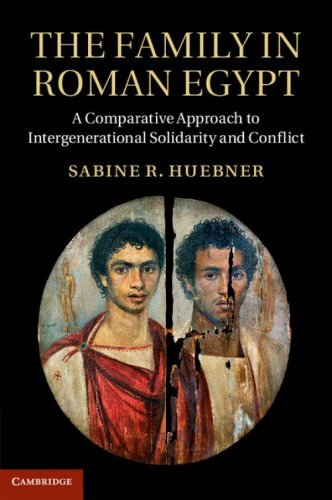 In this absorbing study, Sabine Huebner investigates the generational relationships of the lower and middle classes of Roman Egypt, their family support structures, the obligations of parents and children, marriage, divorce and remarriage, adoption, providing for old age, and the differences between urban and rural families, against the cultural and economic background of the time. There are some sobering statistics. Infant mortality was high in Roman Egypt: barely half of all children born survived to see their fifth birthday and high mortality rates for adults (mostly through infectious diseases) meant that few fathers lived long enough to see their sons marry. Many women were widowed with children to care for while in their twenties and thirties, and in an age when pregnancy and childbirth were always high risk, second marriages were common, as was divorce. These factors exerted a destabilising effect on what was traditionally a patriarchal society (where all the male members of a household were related to each other and females married into the family); a range of different family groups existed, many headed by single mothers. The average size of an urban household was 5.3 members, compared with 4.8 in rural homes. Over 40% of households were made up of a single family, but other homes included extended family, often with an elderly parent. Parents depended on their children to support them in later life and to provide a proper burial. In a chapter entitled Childless in old age: the worst of all fates? Heubner points out that despite the ease of marriage and the much higher birth rates (when compared to modern day), about 25% of those who were fortunate to live to 60 did not have a living child, and in a patriarchal society, those left with only daughters were “almost equally unfortunate”. However, then as now, having children did not always guarantee support in old age. The author concludes that the patterns of household composition for Roman Egyptian families, and the flexible family strategies employed by them, show similarities not only with other traditional patriarchal Mediterranean societies, but also with earlier and later periods of Egyptian history, in particular in the continuity of social custom at the local level. This is another study focussing on the ancient Egyptian family, this time looking back to the Old Kingdom. 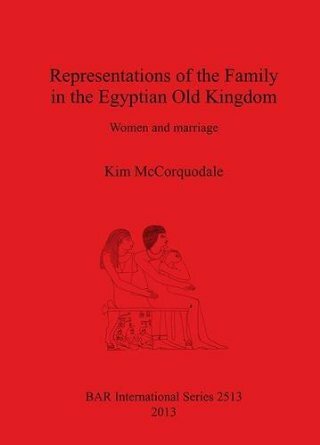 The author analysed the reliefs of women from 803 Old Kingdom tombs at Giza, Saqqara and in the provinces to investigate the place of women in the family and the institution of marriage during this period. Approximately 10% of these tombs did not depict a spouse, but during the reigns of the last two kings of Dynasty Five, Djedkara Isesi and Unas, this figure almost doubles; this may be explained by delays in the building of tombs as a result of a decentralisation of power under the former and a recall of officials to the capital by the latter. Under the reign of Teti at the start of the Sixth Dynasty, stability was restored and the depictions of wives rose again to about 10%, possibly influenced by the king himself: marrying his daughters to his nobles would presumably guarantee their depiction in the tombs of their grateful husbands! Mothers and fathers feature much less frequently, with the occasional mother-in-law appearing in some tombs, and depictions of sisters being rare. There are very few tombs dedicated solely to women, and the majority of these were high status royal women such as kings’ wives or kings’ daughters. In analysing fifteen tombs where more than one wife was depicted, McCorquodale identified ten possible cases of polygamy (as distinct from multiple sequential marriages due to death or divorce), all of which fell between the mid-Fifth Dynasty and the end of the Sixth Dynasty. She concludes that polygamy may have been a privilege of rank for a handful of very high status courtiers, although there is evidence that three lesser officials may have resorted to it in order to produce an heir. 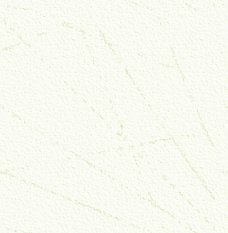 This is a comprehensive study, presented with an extensive bibliography, a detailed appendix of tomb scene drawings, extensive tables of data summarising the depictions of different family members, with more detailed tables for the depictions of women (wives, mothers, sisters, children) including their relative position and accessories (dress, wig, bracelet, etc), and a detailed index of the monuments consulted. 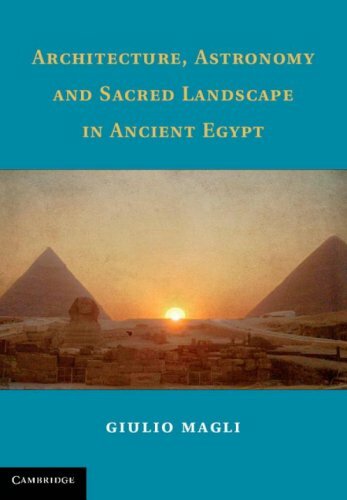 This book is based on the ‘science’ of archaeo-astronomy and in the first part of the book Giulio Magli, Professor of Civil Architecture at the Politecnico of Milan, focuses on the role of astronomy in the alignment of the pyramids of Giza and the other pyramid sites of the Old Kingdom. The second part of the book is devoted to a discussion of the New Kingdom temples, Abu Simbel for instance, and their alignments with the sun and orientations with regards to one another. Linking the stars with the pyramids is something which is always open to controversy (and often incorrect assertions) but it is clear that ‘sightings of the stars’ were used to fix the pyramids’ north-south orientation. So the pyramids do indeed have a stellar as well as a solar connection, and the author correctly introduces the reader to the effects of procession and its effect on the orientation of the pyramids. As would be expected the so-called ‘star shafts’ of the Great Pyramid are considered and are linked with various stars – something which is perhaps over emphasised, as these particular stars did not play a major part in Egyptian religious belief during the Old Kingdom when the king’s afterlife lay elsewhere. There is much that is worthy in this publication, although at times it does assume the reader has a deeper mathematical knowledge than is perhaps the norm, and too often uses technical terms that just seem to confuse the issues discussed. As would be expected from the publishers this is a scholarly work and a thought-provoking study which requires due consideration. Whether or not all the ideas put forward by the author are correct remains to be seen but it does open the topic for rational discussion. 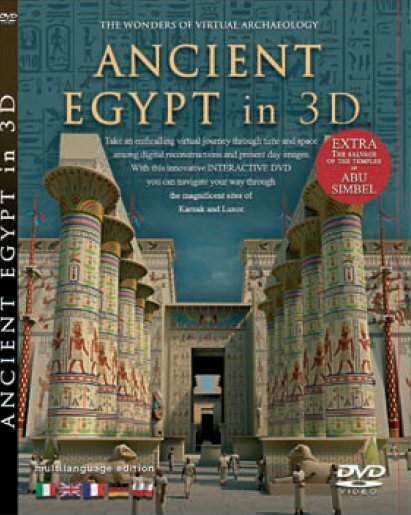 This is a dvd disc that will play on any dvd or blueray player, that takes you on a tour of the major ancient Egyptian sites and includes some ‘interactivity’ in the form of a virtual tour of ancient Thebes. The menu gives you three main options. 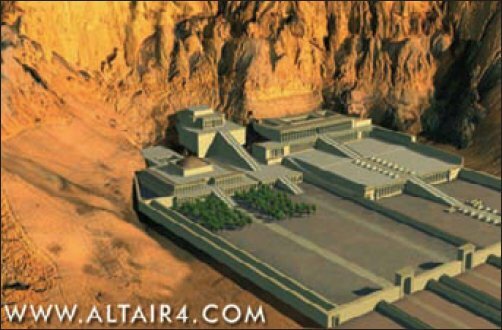 The first takes you to a map of Egypt, and a list of twelve sites, from Alexandria to Abu Simbel, each of which has a 5 minute narrated presentation that uses a mix of video footage, photographs and model reconstructions (eg. 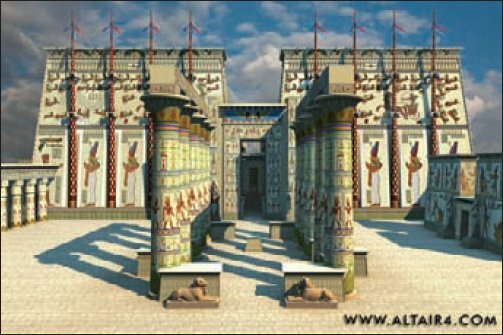 the temples at Deir el- Bahri as shown below). 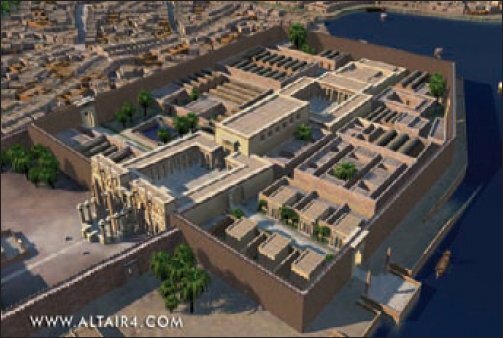 The second option takes you to the reconstruction model of ancient Thebes (see above), allowing you to use your remote control to fly over the town and temples and swoop down into the Temple of Karnak but only as far as the Great Court, with its Kiosk of Taharqo (see below), and into the hypostyle hall. The third option of ‘extras’ offers a short film about the salvaging of the Abu Simbel temples, a rather good slideshow of black-and-white photographs of major monuments taken by Emile Bechard in the 1870’s, a tour of the tomb of Nefertari with good close-ups of some of the wonderful reliefs, and a short animation about the desertification of Egypt that basically shows the models of the monuments becoming covered with sand and the Nile water receding down in front of them. There are one or two anomalies; the old spelling of Aswan (Assuan) and in the narrator’s pronunciation of “Ossear- is” (probably lost in translation from the original Italian); for some reason the Pharos lighthouse is reconstructed against a backdrop of modern Alexandria rather than its contemporary city; and the virtual flythrough is not as interactive as other virtual tours available online or as apps (a more comprehensive app version with greater interactivity has just been released, but only for Windows 8 at present). However as an illustrated introduction to Egypt in dvd format, it’s fun and informative. Why not try to win a copy of this DVD by entering this month’s competition on page 64 of magazine Issue 82?